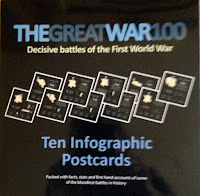 For those who are unsure of what this is, infographic is a combination of information and graphics and these high-quality cards from The Great War 100 deliver both aspects in a clear, concise way that would appeal to anyone with an interest in the First World War. 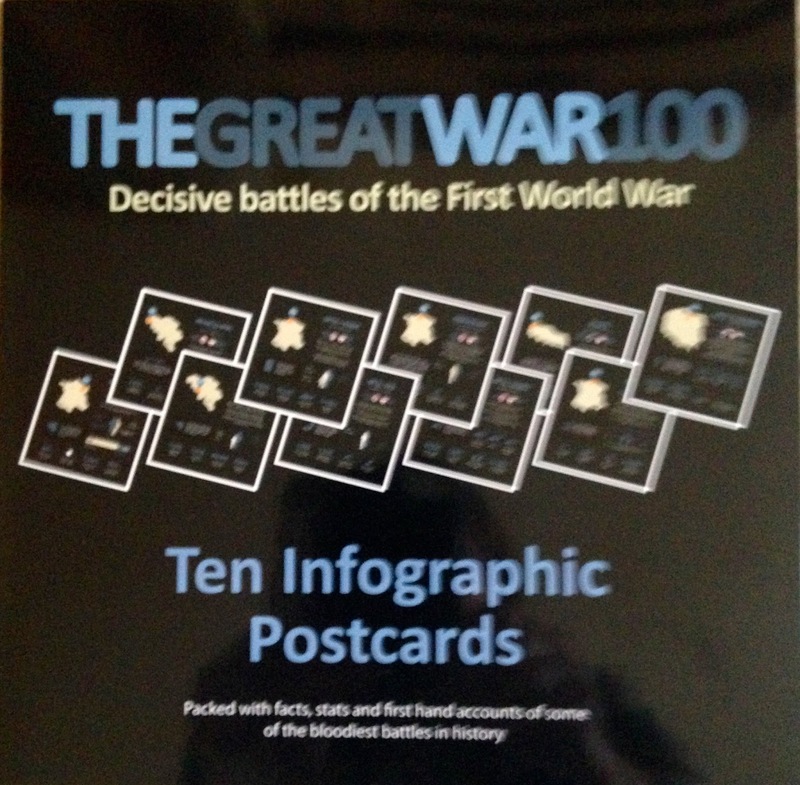 Each pack contains ten double-sided educational cards giving an overview of some of the major battles of the Great War and spanning the years from August 1914 to August 1918. Some are well known and others less so and not all on the battlefields of France and Flanders. We must not forget the Eastern Front or indeed, Gallipoli. The graphics that compliment the statistics are clearly expressed and each pocket of information is interesting, and in no way boring. The maps showing the exact location of each of the ten battles are informative. Do you know how many Victoria Crosses were awarded on the first day of the Battle of Mons, one of the earliest conflicts of the war? Or how many allied planes were used in the Battle of Amiens? The section that really ‘brings it home’ is the one entitled: “I was there.” Quotes from serving soldiers, and not only British ones, offer first-hand personal insight of the conflict and the particular battle in which they played a part. Each highly-recommended glossy card measures 20x20 cms and they are excellent teaching tools, whether in school, history groups or museums. They would also make an extremely good gift. Although they are called postcards, they are not for posting - they are for keeping. These beautifully presented infographic cards are affordable and excellent value. To order yours, just click here. This is an excellent resource whether simply for those interested in the First World War or for the History teacher. Each of the ten robust cards focuses on a major land battle of the war. Information is imparted via concise commentary, maps and ‘pictograms’ on large double-sided cards, each one giving an overview of a battle - Tannenburg, Gallipoli and Verdun are examined as well as those involving the B.E.F. on the Western Front, including the often omitted Battle of Amiens in 1918. There are also some brief eye witness comments from a variety of participants in each battle. Quite a bit of concise information provided which is likely to prompt the reader in search of further detail. Readers of all ages would benefit from the variety of ways in which the information is presented. From an educational point of view there are just enough cards to be shared between 2 or 3 pupils as a lesson resource. Given the limited time available to cover the war this collection lends itself to being the catalyst for each of these groups to carry out further research into each campaign, or an aspect of it or the unit in which the eye witness served. This additional detail could then be shared with the rest of the class. The details on each card ‘throw up’ some interesting additional information for the lay person like the number of casualties among the officers at Loos, why the significant initial gains at Cambria were only temporary or the impact of the breakdown of virtually all the tanks after Amiens, prompting further questions. Why did this happen and what were the consequences? Mr. Addington has written a number of books on the First World War including a well-received ‘companion’ volume which offers other interesting and engaging snippets of information such as a selection of ‘firsts’ and a breakdown of the winners of the Victoria Cross by age range.